Description: For many centuries, Fudebakudo, the Way of the Exploding Pen, has been kept hidden from outsiders. Masters of the art have passed into legend for the secrecy of their techniques and the elusiveness of their knowledge. Finally, after years of painstaking and painful research, this book represents the definitive collection of the martial art of Fudebakudo. Discover the best material for your black belt, and why samurai skilled in hojojutsu never fell for the "undone shoelace" trick. What's the difference, really, between karate and taekwondo? Why are there no buttons in the martial arts? How do ninja turn invisible? Fudebakudo answers the questions, reveals the secrets, and rewrites the history of the martial arts. Fudebakudo. The Way of the Exploding Pen. Much has been written by more accomplished and experienced people than I on the subject. However, as most of them have been killed in mysterious circumstances involving killer vital pressure point mosquitos, sneezing kiaijutsu experts, and a five-foot origami water bomb, I'll see if I can take on the task of writing about this most deadly subject. There have been rumors on the Internet of a definitive yet elusive illustrated step-by-step guide on performing the often practiced (and more often forgotten) "31 count jo kata" practiced in many aikido dojo. This guide was written by none other than the mysteriously named Fudebakudo. After much searching, I found out that Fudebakudo was a series of such guides penned by none other than the even more mysteriously named "Beholder." 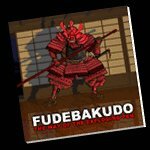 It also turns out that Beholder has recently published a book appropriately entitled, "Fudebakudo, The Way of the Exploding Pen" which is a collection of guides to many martial arts of Japan and of the world. These guides in the guise of simple cartoons take one through a harrowingly funny yet enlightening trip through many martial arts subjects including the more commonly known arts such as taekwondo, karate, judo, and aikido to the more obscure (yet real) arts such as hojojutsu (the art of tying captured criminals), yadomejutsu (the art of stopping arrows in flight), and jobajutsu (horse riding techniques). Funny? How can martial arts be funny? After reading through this book, you'll understand just how humor can be a deadly weapon, indeed. When the ancient martial art of wrestling can be broken down into greco-roman, judo, sumo, WWE, mud, and crocodile, you know you've ventured into some dangerously funny territory. Have you ever wondered if any of the traditional Okinawan weaponry could have descended from shoveling muck (or a combine harvester)? Have you developed your sixth sense enough to have premonitions indicating during your training that "this is going to hurt"? Have you ever thought how cool it would be to have roller skates (or, rather, roller geta) underneath your hakama? Ever think that a particular tai chi move should be called, "Forgetful Monkey Returns to House to Collect Car Keys"? If so, this book is for you. And, frankly, if you haven't, you _really_ need this book since you obviously need to lighten up a bit in your martial arts training. Seriously, this book is illuminatingly funny on every single page. We all know that humor must have some grain of truth in it for it to resonate within us; this book contains many such nuggets of truths and pearls of wisdom (coated in humor to make it go down easier) that I was nodding, shaking my head, and laughing all at once at countless places in the book. If all martial artists retained both the insight and the humor that's contained in each of the illustrations, I think there would be much more harmony and laughter in the martial arts world. And that, to me at least, would be a wonderful thing, indeed. Pros: Brilliant writing and well researched. Illustrations convey the humor and expression vividly. I loved the book.... I even bought extra copies and gave them out as X mas presents to other people practising aikido. Unfortunately not many people in my dojo know about the book. It is indeed a challenge to separate the true history from the fantasy within the book.